On 19 November 1942, a pair of Royal Air Force Halifax bombers shouldered their way through thick winter clouds over Norway with troop-carrying assault gliders in tow. Inside each glider a payload of professional saboteurs from the 1st British Airborne Division weathered a rough ride as the planes approached their intended landing site on frozen lake Møsvatn. Somewhere in the snow-encased hills below, a team of Norwegian commandos vigilantly awaited their arrival. 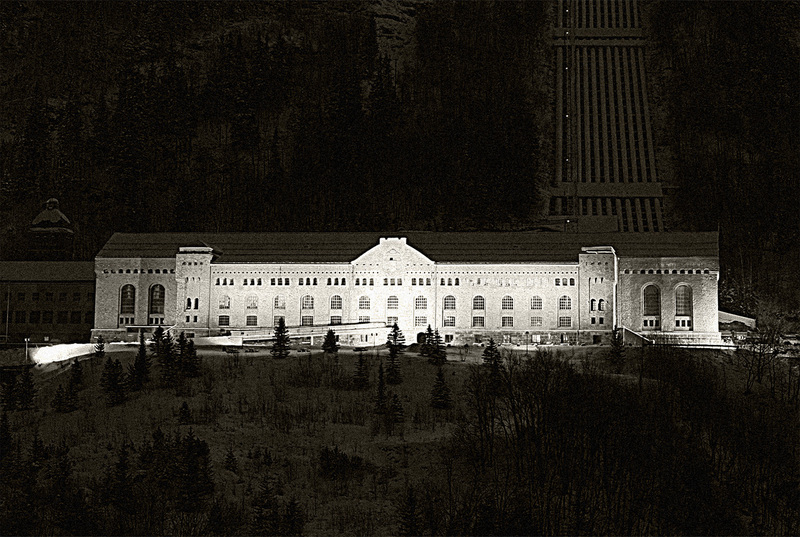 The ultimate objective of the joint mission was to penetrate and incapacitate the Vemork hydroelectric plant, a fortified Nazi facility nestled high in the mountains of Norway. Though the plant’s original purpose had been the production of electricity and fertilizer, the German occupiers were capitalizing on the facility’s ability to collect large amounts of heavy-water— a key ingredient in the Nazi effort to develop an atomic bomb. Written by Alan Bellows, copyright © 19 June 2007. Alan is the founder/designer/head writer/managing editor of Damn Interesting. Suggested by Lauri Pekonen. Last updated 19 February 2016. Second post! Great story. It’s amazing that the Norwegians survived for months out in the wilderness in a good enough condition to be able to mount the attack once fresh supplies arrived. I think the first mushroom cloud at that point would probably have been over Moscow… until quite late in the game, the German leaders saw Great Britain mostly as a thorn in their sides, albeit a painful one. Oh, and DI! Yay for Norway! Hurrah for Alan! That was just like out of a Tom Clancy novel Alan, great work!! I’ve always been a great lover of spies, sabotage, and conspiracies. It’s scary to think Germany came so close to being the first with the atomic bomb. And I think it really does, in a way, reillustrate why the US atomic bombings of Nagasaki and Hiroshima were necessary evils. Just like Knut and the boat he sunk, we have to consider the greater good. A shame it all had to end the way it did, but thank goodness it ended! I do wonder though, are we currently utilizing any heavy-water technology? Or have we advanced well past that? The statement that the subsequent fissions can produce a long term source of heat makes me think maybe they could use it for some kind of energy purposes? Interesting, indeed. The episode of PBS’ “Nova” that dealt with this same set of events downplayed the importance of the nuclear weapons program to the Nazis even further. As an historian interviewed for that episode put it, the Nazis appreciated the potential of a nuclear weapon, but also estimated that their war would be lost or won in too short a time to expend the resources on developing it. The heavy water, as it was stated in the episode, was on its way to a laboratory that was more or less run as a hobby venture. The amount that was brought to the ferry and sunk, they said, was insufficient to use in a serious effort to develop a nuclear weapon. I may be misremembering parts of it–but it was a fascinating show. TOTALLY agree! That was straight out of a Tom Clancey/James Bond, what an interesting story! This is a great story that always leaves me in awe of the commandos that took part in this. The way they survived in the harsh climate with no supplies for so long is a story in itself. I recommend Ray Mears ” The Real Heroes Of Telemark” to anyone interested in this story, it gives a great insight into the amazing endurance and bravery of these guys. Here is a link with a picture of the plant, it also has more information and a picture of the exploded upgrading unit ! I love Norwegian people!!! Someday I will marry a Norwegian rocket scientist. Does that have to do anything with the story? No, but it’s a good goal, along with lots of pie. …GREAT STORY! …”ruling with a plutonium fist”…luv it… way to go Alan! most DI article I’ve read in quite sometime. A+ work! I first read about this fascinating story in Reader’s Digest at least 20 years ago. I probably mis-read the story since at the time I was under the impression that it was British commandos who did the deed. And I didn’t know about the two failed glider insertions. Anyway, what I found fascinating was how the Germans apparently failed to adequately protect this vital plant – I remember that the Reader’s Digest article mentioned that the commandos were fortunate because some officials in the German army underestimated the value of the plant and didn’t think it important enough to garrison heavily. Anyone else remember playing the Medal of Honor level based on this? I enjoyed it most thoroughly, and was highly surprised to discover that, historically, something similar to that mission had actually occurred. Great article Alan! My silly question, is heavy water a poison? In other words, could a drinking water supply be cotaminated with it and cause deaths, or would it simply dissipate into regular H2O? Damn! But wouldn’t this make an intersting movie? Oh yes, they already did that back in the 1960’s… Oh well our loss at thinking we have something original to look forward to. Great story none the less. was more considerably more sinister. I knowI’m nitpicking but I think there is one too many “mores” there. Depending on the conditions, this could produce a long-lived source of heat and neutrons, or a short-lived source of exploding and death. Excellent! I like the way you worded that. DI once again Alan! It is bravery of men like this that make war stories so damn interesting. I do remember an episode of Hogans Heroes where Col. Klink was tricked into taking regular drinks of heavy water by Hogan. And he lived long enough to make a guest appearance on the Simpsons. “U-239 atoms tend to eject a couple electrons over the course of a few days, resulting in weapons-grade plutonium-239” That would be a beta decay then, converting a neutron into a proton and emitting an electron (beta radiation) and an anti neutrino particle. (β− decay to be exact). It makes me wonder, since I have not heard of any stories like this coming out of Iraq, have we lost the ability to do incredible feats of bravery such as this? When you have past presidents who are proud to “loath the military,” shun military service, and spit on those that do serve? Then again, men like htis would never have tolerated being spit on for serving their country and coming from Norway I’ll bet these fine gentleman are still regarded as heroes and I’ll bet that doesn’t change even though the political climate might. …Alan….now that you’ve sufficiently covered various aspects of heavy water, when can we expect the point-counterpoint article on “heavy metal”? In humans Heavy Water is classified as mildly toxic. You would need to ingest enough of it to replace around 30% to 50% of your body’s water (depends on your weight and health). Enough Heavy Water in your system can cause sterility, failure of bone marrow, failure of mitosis, etc. from the buildup of deuterium. Otherwise you must drink nothing but Heavy Water for your entire fluid intake. It could take weeks to months before death. Deuterium buildup in the body creates the same symptoms that one gets from a regiment of chemotherapy. I’m interested in knowing more about where the heavy water came from. Was it (merely) filtered out from vast amounts of normal water? How would you go about doing this? I remember stories of geeky parties where one of the featured attractions would be ice cubes made out of heavy water, which would sink in a drink. Drinking a lot of it is definitely not recommended, but a small amount almost certainly wouldn’t be a problem (especially since it’s part of normal water). it’s safe to have around. (which, IMHO, is an EXCELLENT book). Radiatidon, how did you know that?! !About the water I mean, ;). And Dave, how did you know where to buy the stuff to play with?! Jeeze , yall are a fasinating bunch of folks! fvngvs said: “I’m interested in knowing more about where the heavy water came from. If I remember correctly, heavy water was filtered from regular water, and there were springs in the area that had unusually high concentrations of the heavy stuff. Also, I seem recall to recall that the Nazis were trying to use plates of fissionable material rather than spherical mass. They were years behind on nuclear weapons and even with their heavy water, unlikely to have produced anything substantial before the end of the war. Great suggestion and thanks to Lauri Pekonen. Great story Alan and as always (usually) Damn Interesting. Wow, what an amazing story. I’m proud to be… oh wait, Danish. Never mind. Norway still rocks! “The ferry floundered and sunk”..
Amazing story! I never knew these brave men accomplished such an incredible feat. Really sad that some of them were tortured and murdered, but then again that shows what kind of a person Hitler was. The Vemork raiders really should receive the highest of recognitions for their important contributions to the Allies. DI! The role played by the Norwegians in the destruction of Germany’s heavy water has always been downplayed. Too many history books try to lay all of the credit on the Brits. These men subsisted on moss and lichen? Let’s give these men a lot of credit. It couldn’t have been very nutritious and I seriously doubt it was tasty. Could they have made lichen pie? I knew I read it somewhere. Good book. Nikolaus said: “”The ferry floundered and sunk”..
i’m actually going to Norway for a month on the 5th..
A Damn Interesting coincidence ey? While I don’t have the heart to label this article as one of the most interesting on the site, it is certainly one of the most exciting and best written! What a great read! This is why I love DI! Hey, you have to know about where to get all of these nuclear things. I mean, without a suitable moderator, how could I ever hope to build that nuclear fission reactor in my basement? ;-) Now, where did I put those vaseline glass marbles or that red fiestaware (both of which contain Uranium)? they never figured this out. Even if the sabotage had failed, Germany would not have been able to build a bomb by 1945. The Manhattan Project was a HUGE engineering feat beyond Germany’s capability during wartime. Did you know that the gliders used here, and on D Day were invented by Barbara Cartland, the well-known (and very pink) romantic novelist? “a short-lived source of exploding and death” what a great phrase!! Fasinating article!! Your Kidding! No Sh*t!? I love that! I also recently read/learnt that Dr. Ruth Westingheimer (sp?) was a crack shot; marksman & sniper in Israel when she was in her late teens,early twentys..wow, huh? & Thanks to you Dave for the cool links and explaination, too. LMAO : Hookd on foniks warked for me! Tink: All we need now are some frickin’ sharks with some frickin’ lazer beams attached to their heads. If only we had a similar effort against the Soviet Union at the same time. I would change the wording of this, you should say beta decay rather than just losing electrons. It implies that it becomes an ion instead of a different element altogether. There was also a PBS program (Maybe it was the NOVA one) where they recovered the barrels on the ferry from the bottom of the lake. It was still sealed and had all the water. Not sure what they did with it though. Good point… I was attempting to cut down on the atomic jargon, but I don’t want to be too ambiguous. I’ll go moderately reinforce that phrasing. Thanks for pointing out the weak spot. Yes it is a true story. There has been made a reconstruction on film as described above. Main actor was Kirk Douglas in Heroes of Telemark. Some of these heroes are still living and they are the highest decorated soldiers ever. I enjoyed the article….I was trying to find more information on the whole operation as my great great grandfather apparently had a very important part of the sabotage. There is more to the story…much more behind their attempt. I have a plaque given to my grandfather from the king of Norway thanking him for his part in these operations. My grandfather and supplied them with maps and charts of the area which supposedly allowed them to find and destroy. This was kept secret by him until after his death when the document was found and there was a huge newspaper article written about his part in this action. As a young man he had mapped that whole area and heard about their need for maps and supplied them. Kinda interesting, huh? I hate to be late to the grammar party, but his use of “floundered” was perfectly acceptable. Also, great site! I got sent here via StumbleUpon and I’m really enjoying catching up on all the stories. “Floundered” is INcorrect, of course. another Damn Interesting article! !great work! Indeed, they could make a film of this, and the Americans could pretend they were the saboteurs, a bit like their phoney role in the film ‘Enigma’. Totally agree with Dacoobob by the way, but history is full of tiny pivotal points (and is the sum of its parts), had it not been for the battle of Britain (for example) , Hitler might not have thrown himself into Russia quite so heavily; had he invaded the UK, had we failed in the skies at that point The US could never have joined the war in europe and though the Russians would still doubtless have thrown him back they might have agreed a truce with Britain/US out of the game and allowed him to keep his European empire intact. But I agree that the Soviet force (and their generals Winter and starvation) were the most powerful force in the war (so what’s new). This is several orders of magnitude incorrect. Try a range of 1:5,000 to 1:7,000 for deuterium oxide:terrestrial water. Heavy Water as the sole water intake poses substantial risks to organisms which absorb it. The question is, at what level in our water supply is this D2O safe and of no demonstrable danger. To put it another way, an older person may have consumed a liter or two of deuterium oxide, lifetime. Does this consumption play any part in the aging process? It is possible, even perhaps likely, that it is retained by the body preferentially to Light Water. If that is the case then will older people have an increased level in their tissues? You have struck on an important point. We are not just talking about H2O and D2O, but DHO as well. And generally. when we are talking about “heavy water” it is not a pure liquid only containing D2O, although it gets close. My particular area of interest has to do with the cumulative metabolic effects of deuterium as its’ concentration to the organism is increased in the water supply, or as it accumulates in the organism over time. For my purposes, the DHO is in the count. My instinct is that the number for the ratio of D2O to DHO and H2O combined would be on the order of 1:10,000,000+. But in this ratio, we are ignoring the 3000+ molecules which each contain 1 D atom. I have seen no data that gives too clear an idea of the difference(s) in the characteristics of D2O and DHO. It is only a guess that the DHO figures are likely to be roughly midpoint between the extremes of D2O and H2O. I personally have not come across any commercial sources for DHO. Only D2O of about 99.8% purity. For damping neutrons or for biological studies, that is sufficient purity to do the job.. Heavy water is water (H2O) in which oxygen is bound to atoms of the hydrogen isotope deuterium (2H). Heavy water is so named because it is significantly more dense (>1.1 g/cm3) than ordinary (“light”) water, 1H2O (1 gm/cm3). Heavy water is not radioactive and has the same chemical properties as light water; a person could drink a glass of heavy water without harm. However, heavy water is better than light water at moderating (slowing) neutrons, which makes it useful in some nuclear reactor cores. Its scarcity during World War II, partly assured by bombing raids and daring Allied commando missions to destroy heavy-water production facilities, interfered critically with the German and Japanese nuclear programs. It is believed the big bang produce the universe that was much denser and hotter than it is now and made almost entirely of two main elements – hydrogen and helium. Deuterium itself was made only at a second stage of the beginning of the universe, namely through the collision of one neutron with one proton at a temperature of about one billion degrees; furthemore the two formed deuterons in turn stuck together into helium nuclei, which contain two protons and two neutrons. It is considered, that during the formation of helium nuclei, almost all the deuterons combined to form helium nuclei, leaving a tiny remant to be detected today so that only one in 10.000 deuterons remained unpaired. Thus, deuterium serves as a particularly important marker. The quantity of deuterium in contemporary nature is approximately small and measured as no more than 0.015% (from the whole number of hydrogen atoms) and depends strongly on both the uniformity of substance and the total amount of matter formed in course of early evolution. One may suggest, that the very reliable source of producing of deuterium theoretically may to be the numerical explosions of nova stars, but deuterium itself is very readily destroyed in those stars. If it was so, perhaps this was the answer to the question why the quantity of deuterium increased slitely during the global changes of climate for worming conditions.Either way or not, the model of deuterium evolution provides a framework for predicting the biochemical consequences of such new fascinating ideas. Deuterium (2H), the hydrogen isotope with nuclear mass 2, was discovered by Urey. In the years immediately following this discovery, there developed a keen interest in development of methods for uniform biological enrichment of a cell with 2H, that may be best achived via growing of an organism on medium with high content of heavy water (99% of deuterum), which since yet resulted in a miscellany of rather confusing data (see as an example Katz J., Crespy H. L. 1972). What is the nature of this interesting phenomenon of biological adaptation to heavy water and what is the role of life important macromolecules (particularly DNA, individual proteins, and/or enzymes) in this process? It is seems very likely, that during adaptation to heavy water the structure and conformation of [U -2H]labeled macromolecules undergoing some modifications that are more useful for the working in heavy water-conditions. There have to be distingueshed three aspects of biological enrichment with deuterium: chemical, biological and biophysical aspects, all of them are connected in some way with the structure of [U -2H]labeled macromolecules. The presence of deuterium in biological systems certainly could be manifested in more or less degree by changes in the structure and the conformation of macromolecules. It is important what precise position in macromolecule deuterium ocupied and dipending from that the primary and secondary isotopic effects are distingueshied. The most important for the structure of macromolecule the hydrogen (deuterium) bonds form between different parts of the macromolecule and play a major part in determining the structure of macromolecular chains and how these structures interact with the others and also with heavy water environment. Another important weak force is created by the three-dimentional structure of water (heavy water), which tends to force hydrophobic groups of macromolecule together in order to minimize their disruptive effect on the hydrogen (deuterium)-bonded network of water (heavy water ) molecules. The screw parameters of the proton helix are changed by the presence of deuterium so that ordinary proteins dissolved in heavy water exhibit a more stable helical structure (Tomita K., Rich A., et all., 1962). While heavy water probably exerts a stabilizing effect upon the three-dimentional hydrogen (deuterium)-bonded helix via forming many permanent and easily exchangeable hydrogen (deuterium) bonds in macromolecule in the presence of heavy water (as an example the following types of bonds -COO2H; -O2H; -S2H; -N2H; N2H2 et. ), the presence of nonexchangeable deuterium atoms in amino acid side chains could only be synthesized de novo as the species with only covalent bonds -C2H, causes a decrease in protein stability. These opposing effects do not cancel with the case of protein macromolecule, and fully deuteration of a protein often results in the destabilization. As for the deuteration of DNA macromolecule, today there are not reasonable considerations that such negative effect of heavy water on the structure and function is really existiting. Nevertheless, deuterium substitution can thus be expected to modify by changes in the structure and the conformation of both [U- 2H]labeled DNA and protein, not only the reproductionl and division systems of a cell, and cytological or even mutagenical alterations of a cell, but to a greater or lesser degree of an order of a cell. Heavy water blocks mitosis in the prophase and the early metaphase of many cells grown in heavy water . The blockage, however, was overcome if the initial concentration of heavy water was not too high and the exposure time not too long. In experiments with eggs of the fresh water cichlid fish Aequidens portalegrensis, they observed that in 30% heavy water only one-fifth of the eggs hathed and in 50% (v/v) heavy water none did so. Segmentation in fertilized frog eggs developed normally for 24 hours in 40% (v/v) heavy water , after which the embryos died. It was also found by that heavy water disturbed embryogenesis in Drosophila melanogaster eggs (Lavillaureix et all., 1962. Feeding female flies with 20% (v/v) heavy water caused a significant increase in the proportion of nondeveloped eggs, whether males were deuterated or not. The reason for the cessation of mitotic activity from exposure to heavy water is not clear. Certain microorganisms have been adapted to grow on fully deuterated media. However, higher plants and animals resist adaptation to heavy water . Even in microorganisms, however, cell division appears initially to be strongly inhibited upon transfer to highly deuterated media. After the adaptation, however, cellular proliferation proceeds more or less normally in heavy water, but this stage is not reached in higher organisms. No ready explanation in terms of the present understanding of mitosis suggests itself. In Arbacia eggs antimitotic action of heavy water is manifested almost immediately at all stages of the mitotic cycle and during cytokinesis (Gross P. R., et all., 1963, 1964). A stabilizing action on the nuclear membrane and gel structures, i.e., aster, spindle, and peripheral plasmagel layer of the cytoplasm, can be detected. Prophase and metaphase cells in 80% (v/v) heavy water remain frozen in the initial state for at least 30 minutes. Furrowing capacity probably is not abolished by heavy water. The heavy water -block is released on immersion in heavy water although cells kept in deuterium-rich media for long periods show multipolar and irregular divisions after removal to heavy water , and may subsequently cytolyze. The inhibition of mitosis in the fertilized egg is not the only interesting effect of deuterium. The unfertilized egg also responds. It was described that deuterium parthenogenesis in Arbacia in the following graphic terms: if an unfertilized egg is placed in heavy water, there appear in the cytoplasm, after half an hour, a number of cytasters. The number then increases with time. If, after an hours immersion in heavy water, eggs are transferred to normal sea water, a high proportion (80% of the population) raises a fertilization membrane, which gives evidence that activation has occurred. De Giovanni and Zamenhof have carried out the most comprehensive investigations on the genetic effects of deuterium in bacteria. The results are of considerable interest. For example, they found a several mutants of E. coli, including a so called rough mutant 1/D which is more resistant to heavy water than its parent strain, were isolated from E. coli grown in heavy water media. The spontaneous frequency of occurerence of this mutant was 10-4, and the mutation rate could be increased 300-fold by ultraviolet irradiation. This mutant was derived only from the strain E. coli 15 thymidine, and no similar mutant was observed in other strains of E. coli or B. subtilis. By application of a fluctuation test, the researchers were able to show convincingly that this mutation to increased deuterium resistance occurred spontaneously and not in response to the mutagenic effect of heavy water. Back mutations in some instances do seem to occur at higher rates in heavy water. Reversion from streptomycin dependence to streptomycin sensitivity in E. coli strain Sd/4, or from thymine dependence to thymine independence in strain 1 occurs with higher frequency in heavy water , but heavy water does not cause a discernible increase in mutation in the wild type. But, paradoxically, many cells of bacterial and algae origin could, nevertheless, well grown on absolute heavy water and, therefore, to stabilize their biological apparatus and the structure of macromolecules for working in the presence of heavy water. The mechanism of this stabilization nor at a level of the structure of [U-2H]labeled macromolecules or at a level of their functional properties is not yet complitely understood. Adaptapion to heavy water is a complex phenomenon resulting both from the changes in structural and the physiological level of a macrosystem. That is why there is every prospect that continued investigation of deuterium isotope effects in living organisms will yield results of both scientific and practical importance, for it is precisely. The studies of the structure and the functioning of biolodical important [U -2H]labeled macromolecules obtained via biological adaptaition to high concentrations of heavy water are most attract an attention of medical scientists as a simple way for creating a fully deuterated forms of DNA and special enzymes could well be working in a certain biotechnological processes required the presence of heavy water. Secondly, if the structure of fully deuterated proteins may be stabilized in heavy water in a view of duarability of deuterated bonds, it would be very interesting to study the thermo-stability of [U -2H]labeled proteins for using them directly in processes going at high temperatures. THE PREPARATION OF DEUTERATED MACROMOLECULES. Method 1 is very useful for the preparation of [U- 2H]labeled macromolecules if only applyed strains of bacterial or different origin could well be grown on minimal media in the presence of high concentrations of heavy water. Very often in this case the biological adaptation to heavy water is required. BIOLOGICAL ADAPTATION TO HEAVY WATER. Our research has confirmed, that ability to adaptation to heavy water is differed for various species of bacteria and can to be varried even in frames of one taxonomic family (Mosin O. V. et al., 1996a, 1996b). The adaptation to heavy water is determined both by taxonomic specifity of the organism, and peculiarities of the metabolism, as well as by functioning of various ways of accimilation of hydrogen (deuterium) substrates, as well as evolutionary level, which an object occupies. The less a level of evolutionary development of an organism, the better it therefore adapts itself to heavy water. For example, there are halophilic bacteria that are being the most primitive in the evolutionary plan, and therefore, they practically not requiring to carry out a special adaptation methods to grow on heavy water. On the contrary, bacills (eubacteria) and methylotrophs (gram-negative bacteria) worse adapted to heavy water . However, when the adaptive process goes continuously during the many generation of cells, the population of cells can use a special genetic mechanisms for the adaptation to heavy water. For example, mutations of geens can be resulted in amino acid replacements in molecules of proteins, which in turn could cause a formation of a new isoenzymes, and in the special cases – even the anomal working enzymes of a newer structure type. The replacements of these compounds can ensure a development of new ways of regulation of enzymic activity, ensuring more adequate reaction to signals, causing a possible changes in speeds and specifity of metabolic processes. Despite this fact, the basic reactions of metabolism of adapted cells probably do not undergo essential changes in heavy water. At the same time the effect of convertibility of growth on water- heavy water does not theoretically exclude an opportunity that this attribute is stably kept when cells grown on heavy water , but masks when transfer the cells on deuterated medium. 3. adaptation at a functional level, when the change of an overall performance of macromolecular systems, is not connected with a change of a number of macromolecules being available or with the macromolecules of their types. Adaptation in this case could provide the changes by using the already existing macromolecular systems – according to requirements by this or that metabolic activity. THE ISOTOPIC EFFECTS OF HEAVY WATER. When the macromolecules transfer to deuterated medium not only water due to the reaction of an exchange (protonated water- heavy water) dilutes with deuterium, but also occurs a very fast isotopic (1Н-2Н)-exchange in hydroxylic (-OH), carboxilic (-COOH), sulfurhydrilic (-SH) and nitrogen (-NH; -NH2) groups of all organic compounds including the nucleic acids and proteins. It is known, that in these conditions only С-2Н bond is not exposed to isotopic exchange and thereof only the species of macromolecules with С-2H type of bonds can be synthesized de novo. This is very probably, that the most effects, observed at adaptation to heavy water are connected with the formation in heavy water [U -2H]labeled molecules with conformations having the other structural and dynamic properties, than conformations, formed with participation of hydrogen, and consequently having other activity and biophysical properties. According to the theory of absolute speeds the break of С-H-bonds can occur faster, than С-D-bonds, mobility of an deuterium ion is less, than mobility of protium ion, the constant of ionization heavy water is a little bit less than ionization constant of heavy water. So it would be much easy to obtain energy from heavy water than from ordinary water. Thus, in principle, the structures of [U -2H]labeled macromolecules may to be more friable that those are forming in ordinary heavy water. But, nevertheless, the stability of [U -2H]labeled macromolecules probably depending on what particular bond is labeled with deuterium (covalent bonds -CD that causing the instability or hydrogen bonds causing the stabilization of conformation of macromolecules via forming the three-dimentional netwok of hydrogen(deuterum) bonds in macromolecule) and what precise position of the macromolecule was labeled with deuterium. For example, the very valuable and sensitive for deuterium substitution position in macromolecule is the reactive center (primary isotopic effects). The non-essential positions in macromolecule are those ones that situated far away from the reactive center of macromolecule (secondary isotopic effects). It is possible, that the sensitivity of various macromolecules to substitution on 2Н bears the individual character and depending on the structure of macromolecule itself, and thus, can be varried. From the point of view of physical chemistry, the most sensitive to replacement of protium by deuterium can appear the apparatus of macromolecular biosyntesis and respiration system, those ones, which use high mobility of protons (deuterons) and high speed of break of hydrogen (deuterium) bonds. From that it is posible to assume, that the macromolecules should realize a special mechanisms (both at a level of primary structure and a folding of macromolecules) which could promote the stabilizition of the macromolecular structure in heavy water and somewhat the functional reorganization of their work in heavy water. The successful adaptation of organisms to high concentration of heavy water will open a new avenues of investigation with using [U- 2H]labeled macromolecules could be isolated from these organisms. For example, fully deuterated essential macromolecules as proteins and nucleic acids will give promise of important biological, medical and diagnostical uses. Modern physical methods of study the structure of [U- 2H]labeled macromolecules, particularly three-dimentional NMR in a combination with crystallography methods, X-ray diffraction, IR-, and CD- spectroscopy should cast new light on many obscure problems concerning with the biological introduction of deuterium into molecules of DNA and proteins as well as the structure and the function of macromolecules in the presence of heavy water. The variety of these and other aspects of biophysical properties of fully deuterated macromolecules in the presence of heavy water remain to be an interesting task for the future. Еgorova T. A., Mosin O. V., Shvets V. I., et al. // Biotechnologija. 1993. N.8. P. 21-25. Fesic S. W. and Zuiderweg E. R. // Quarterly Reviews of Biophysics. – 1990. – V.23. – N.2. – P. 97-131. Mosin O. V., Egorova T. A., Chebotaev . B., Skladnev D. A., Yurkevich A. M., Shvets V. I. // Biotechnologija. 1996b. N 4. P. 27-34. Shvets V. I. // Biotechnologija. 1996c. N 4. P. 19-26. Skladnev D. A., Mosin O. V., Egorova T. A., Eremin S. V., Shvets V. I. Methylotrophic bacteria as sourses of 2H-and 13C-amino acids. // Biotechnologija. N 5. 1996. P. 14-22. Shvets V. I., Yurkevich A. M., Mosin O. V., Skladnev D. A // Karadeniz Journal of Medical Sciences. 1995. V.8. N 4. P.231-232. OlegMosin – it seems you killed it. I saw those glasses in the Museum that now exist inside the factory. Just my two cents on an awesome story! While serving in the Royal Navy l was stationed in Norway in the 70’s. On a family trip in our VW camper we were in Telemark across the valley from the plant. I had stopped to take a better look when there were a series of small explosions in the buildings at the plant I took some photos at the time. However l have not seen any reference to this in any article since. I wondered if you or your readers could assist. I watched the HERO’S OF TELEMARK last night for at least the 15th time.I stars Kirk Douglas & Richard Harris, great flick. Goes just like the article hear. Watch if you can you won’t be dissapointed. I started Damn Interesting before this article appeared, yet I somehow missed it. This is one of the best articles I’ve read so far in DI. It’s been a year already, and I have returned. But no one else has posted? Pitiable.